My stats book for the month is “Statistics Done Wrong“, which honestly I haven’t actually started yet. I got sidetracked in part by a different math related book “Genius at Play: the Curious Mind of John Horton Conway” He’s a pretty amazing (still living!) mathematician, and the book about him is pretty entertaining. If you’ve never seen a simulation of his most famous invention “Game of Life”, check it out here. Deceptively simple yet endlessly fascinating. Moving on, this Atlantic article about why for profit education fails was really interesting. Key point: education does best when it’s targeted to local conditions, which means it actually becomes less efficient when you scale it up. This list of the “7 deadly sins of research” was also delightful. It specifically mentions basic math errors, which is good, because those are happening a really concerning amount of the time. Related to deadly sins, Andrew Gelman gives his history of the replication crisis. Related to the replication crisis, holy hell China, get it together. More replication/data error issues, but this time with a legal angle. Crossfit apparently is suing a researcher and journal who 1. worked for a competitor 2. published data that made Crossfit look bad that they later clarified was incorrect 3. had evidence that the journal/reviewers implied that they wouldn’t publish the paper unless it made Crossfit look bad. The judge has only ruled that this can proceed to trial, but it’s an interesting case to watch. In case you’re curious, top verbal scores are closer to 1:1. Curious what the recruitment practices are for the Duke program. Also, some old data about Lyme Disease resurfaces, and apparently there may be a second cause? An interesting look at the “Swiss Agent” and why it got ignored. This paper on gender differences in math scores among highly gifted students was pretty interesting. My investigation of the subject for an Education class led me to the conclusion that there was a higher concentration of males at both ends- severely mentally retarded and high IQ. Female concentrations were higher in the middle- more stable than males. This Education class had a guest speaker, a Dean in the Ed school who was vehement on the issue of females being shunted out of science. As my mother had an MS in Biology and my sister an MS in Engineering, I was not inclined to that point of view. The Dean gave us a great quote: “My father was a physician. My brother is a physician. And here I am, in Education.” Rather bitter, no? That reminded me of my sister’s best friend in high school, who had the best Math SAT score for females in her class. Her father was a physician. She got her doctorate in Ed Psych. Does this fit the Education Professor’s narrative? Not quite, because not only was her father a physician, her mother was also a physician. Moreover, her doctoral dissertation in Ed Psych found a genetic difference between male and female math abilities. As the conclusion of her dissertation didn’t fit the accepted narrative, she had trouble obtaining a faculty position, and eventually stopped trying. But the dynamics in the family of that Ed school Dean- or the relative allocation of IQ in that family- who knows? I’ve been meaning to poke around and see if there is any new data on this and if anything’s changed. I was struck by that paper when I saw someone link to it because of the time trend, which seems to suggest older data may have some bias but more recent data may be stabilizing. 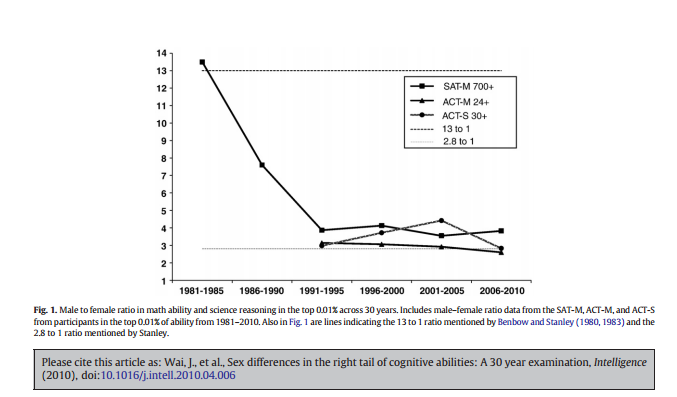 That suggests the M/F variance ratio is 1.11, so men are still more variable than women in math scores. Interestingly, the “more men in the upper percentiles” effect is still relatively strong for white folks, but doesn’t exist for Asians. Camilla Benbow has done a lot of research on mathematically precocious youth, both on their early years and where they end up. I think the amazing thing about this study is that the ratio dropped so dramatically in a ten year span. What in the world were they teaching and testing on prior to the mid-90s? I didn’t get a chance to poke in to the Duke program, but I was wondering if that was more of a pipeline problem getting fixed. Perhaps they weren’t recruiting many mathematically gifted girls prior to that, or girls weren’t being encouraged to apply to the program? I know the test changed in 1994, but that wouldn’t explain all of the drop since that would only have been 2 of the 5 years in that cluster. Curious.